"I would prefer not to, but..."
That is the excuse at the heart of Tanzer's well-executed science fiction tale. Which at first seems odd for the author, but it is very Tanzer-esque. He's cut his teeth writing real-world stories of guys who are inept in their own skins. Men who aren't quite ready for the maturity required in a real relationship. Or definitely not prepared for fatherhood. And they'd rather just bury themselves in a pair a headphones and smother all those problems with a soundtrack that brings back all the good memories of the past (rather than the ever-encroaching present). So at the heart of his first and only science fiction novel, Tanzer is covering similar ground. The guy has an oeuvre. But he's also smart enough to know the best science fiction tales are, at their core, simple. They are meant to reflect our own foibles. 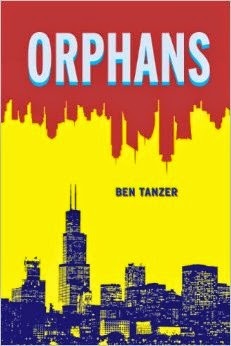 In the futuristic Chicago of Orphans, there are still hapless guys who need to provide for their families. For Norrin Radd, the protagonist, there are bills to pay and a family to feed and sacrifices to be made to achieve both goals. Society has fallen under the control of a single Corporation. If you want to work, you play ball. Or you get cast out. You can provide for your family and live in one of the sanitized districts (enforced by constant surveillance and black helicopters) or you can live on the streets with the unemployed. They have E.C. 's (electronic concierges) and Terraxes (robot labor) to handle the menial jobs. The latter work tirelessly until one day they malfunction and keel over, only to be recycled. Hence the constant refrain of "I would prefer not to, but...". Radd goes along, but not without consequences. He winds up having to travel back and forth between Mars, selling real estate to one-percenters who want to be 'pioneers,' and quickly growing weary of spending all of his time with sweet-talking E.C.s who only serve as reminders of how much of a sucker he is after all. Meanwhile, back home, a carefully programmed Terrax is filling in with his family. And all those insecurities about what happens while he is away start creeping into Radd's brain. Reviewer bio: Ken Wohlrob is the author of the novel No Tears for Old Scratch and two short story collections.